The Moral Animal is a 1994 book by Robert Wright. 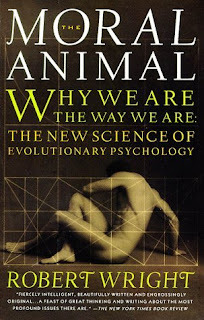 The New York Times Book Review chose Wright's The Moral Animal as one of the 12 best books of 1994; it was a national bestseller and has been published in 12 languages. The book explores many facets of our everyday life through the lens of evolutionary biology. Wright attempts to relay Darwinian explanations for human behavior and psychology, our social dynamics and structures, as well as our relationships with lovers, friends, and family. The book borrows extensively from Charles Darwin's official publications, including his famed Origin of the Species, but also from his less well-known chronicles and personal writings, illustrating behavioral principles with Darwin's own biographical examples.